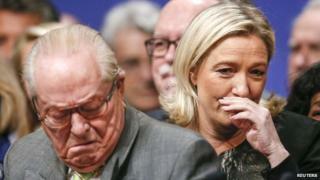 Image caption Last week, Ms Le Pen accused her father of committing "political suicide"
The founder of the French National Front, Jean-Marie Le Pen, has said he is pulling out of regional elections amid a row with his daughter. Marine Le Pen, who now leads the far-right party, condemned her father for his recently repeated claims Nazi gas chambers were a "detail of history". He told the Figaro he would not be standing in the south-eastern Provence-Alpes-Cote d'Azur (Paca) region . But he said he thought he was "the best candidate for the National Front". Opinion polls suggest Marine Le Pen is likely to make it to the second round of 2017 presidential elections, although she is not predicted to win. The National Front also made significant gains in local elections last month, polling 25% of votes in the first round. Mr Le Pen said his 25-year-old granddaughter Marion Marechal-Le Pen - Ms Le Pen's niece - would be the best person to stand in his place. "If she accepts, I think she would head a very good list [of candidates]. She is certainly the best, I am not going to say after me, but she is," he told the newspaper's weekly magazine. Mr Le Pen, who is honorary president of the party, is to publish a statement later on Monday to confirm his intentions regarding the election, the newspaper reports. It is the Greek drama of French politics; the political family, so long attacked from outside, now turning on each other in the full glare of public life. But Jean-Marie's influence has long been on the wane. Despite being honorary president of the party, decisions on its direction and personnel are made without him, and a poll this month by Odoxa found that almost 90% of Front National supporters believe it is time for Jean-Marie to withdraw from political life. The poll also suggests that the party's image would be vastly improved if he were to be ejected. But the question for his daughter now is whether the electoral benefits of political parricide will outweigh the impact of a public feud. Whatever his future role in the Front National might be, Jean-Marie Le Pen has never been one for keeping his views to himself. He is currently an MEP and a regional councillor for the Paca region. The party's vice-president, Florian Philippot, described Mr Le Pen's decision as as a "wise" one. Ms Le Pen has tried to rid the party of its racist image, the BBC's Lucy Williamson in Paris reports. Last week's defence by Mr Le Pen of his description of the Holocaust as "a detail" of World War Two prompted Ms Le Pen to say she would block his candidacy in the December polls and to demand that his role in the party be discussed at a meeting of party executives on Friday. Mr Le Pen also gave a couple of interviews earlier this month in which he said the French wartime leader Marshal Petain, who collaborated with the Nazis, was unfairly maligned. He went on to say that France was governed by immigrants - singling out Prime Minister Manuel Valls, who is of Spanish heritage - and that France needed an alliance with Russia to save the "world of the whites". 1987: First makes his infamous remarks describing the Holocaust as a "detail of history"
2007: Tells Le Monde newspaper "you can't dispute the inequality of the races"
2015: Repeats views on the Holocaust, prompting Marine Le Pen to accuse him of trying to "rescue himself from obscurity"
A step closer to power for the FN?